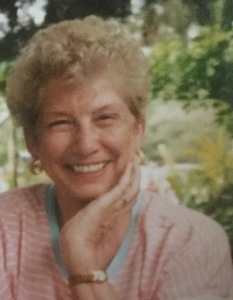 Obituary for Janet Mae Boring | Penzien Funeral Homes, Inc.
Janet Mae Boring was an extraordinary person who loved life and family and will be missed dearly by all who knew her. She was born on Aug. 4, 1934 and lived in Boyne City until she was 20. She married the love of her life, Bryan Orrie Boring, in 1954 and they were together for 50 years until he died in 2005. They lived in Livonia and Portage before moving to Traverse City in 1970. They owned a cottage on Torch Lake, which was the gathering place for family and friends for over 20 years. Janet was a wonderful mother and raised three children. She enrolled in college in her 40s because she decided she wanted a career after her children were older. She earned a degree at Northwestern Michigan Community College and worked as a bookkeeper at TBA in Traverse City for 15 years. She was a talented seamstress who designed and made her own clothing as a young woman. Throughout her life she retained an interest in fashion and was known for her ability to assemble the perfect outfit from a seemingly endless wardrobe. She enjoyed wine and family get-togethers, watching sports and going to the casino. She played bridge and was a member of several local bridge groups. She was well-read and enjoyed many of the arts, including music and films. She attended the Traverse City Film Festival every year from its inception until she became ill two years ago. She was intelligent and open-minded and gravitated toward edgy movies, television series and documentaries. She followed current events and politics closely and was an excellent conversationalist with an extensive knowledge of a wide variety of topics. She doted on her five grandchildren, Nick (Betsy) Corey, Brandy Shaw, Brianna Boring, Christopher (Edwina) Boring and Kaitlyn (Nathaniel) Tippett; and three great-grandchildren, Ian Shaw and Lauren and Zachary Corey. She is also survived by her children, Coleen (Paul) Corey, David (Rebecca) Boring and Mark (Stephanie) Boring; and two sisters-in-law, Nancy Paquette and Mary Neumann. In addition, she leaves behind numerous nieces, nephews, cousins and friends, chief among them, Darlene (Cooley) Sommerville, with whom she shared a lifelong friendship that began before kindergarten, and Darlene's husband, Max. Loved ones who preceded her in death include a brother and sister in infancy; her parents, George Paquette and Louise Arsenault; her brother, Michael Paquette; her sister, Vonnie Raugh; as well as her dear friends, Joe and Betty Boring. Janet left instructions to thank everyone who called or visited during her long illness. A memorial to celebrate her life will be held in the spring.